This has been one crazy week! 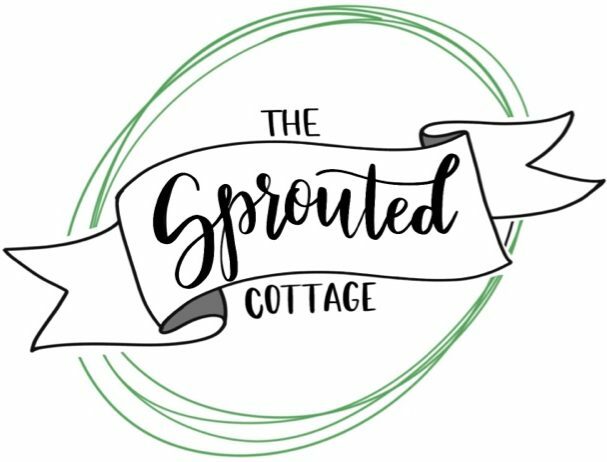 When we planned out this Summer Produce Series, we chose this week in July because our produce would be ripe and our schedule was open. I received a call from our friends that there was a fire less than a mile from our cottage. I raced home with the Sprout to prepare for evacuation while Dave finished up at work and awaited details. When I got to our street, officers had already barricaded my neighborhood and I had to provide ID to get in. As I listened to the helicopters and spotter plane circle above our home, the Sprout gleefully watched a program in the background. Oh to be a toddler again! I don’t do fires very well and I was so thankful that she wasn’t catching on to my anxiety! A peek of the fire from our backyard. Thankfully, our fire department was able to get a quick jump on the flames, had it contained in a matter of hours and we never received a mandatory evacuation. It was a lot of excitement and anxiety for our small community. Meanwhile, 4 hours away, our families were in the center of their own inferno. A fire that started in the grasslands northwest of Mariposa had turned into an erratic fireball threatening several small towns and causing the evacuation of over 5000 people. My (Elizabeth’s) dad called during my own race home to see if they could evacuate to our house in the event that the Detwiler Fire proceeded south like it was showing. We made arrangements and I was relieved to know I had a place for them because our incident had been contained. 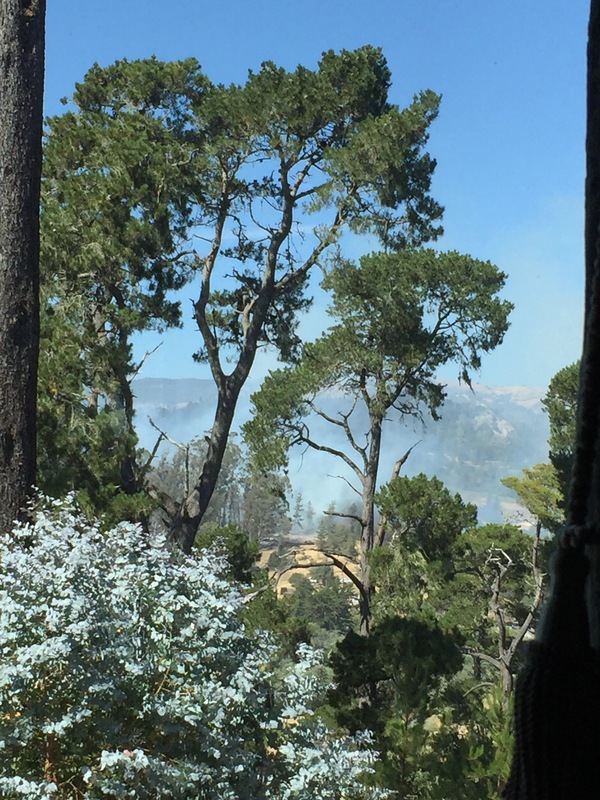 The Detwiler fire is still an inferno and causing lots of destruction, but we are so thankful for the response by local community members as well as communities across the state who are providing for victims of this blaze in my childhood hometown. Our families are safe but still dealing with smoke (which apparently can be seen all the way in Boise, Idaho today). That brings me to today, Day 2 of our series which is three days late…We are a little behind but we make a great team so we will catch you up! Two very popular summer crops are showcased here in day two of our Summer Produce Series. Tomatoes and cucumbers are extremely popular during summer. Nothing tastes quite like a summertime tomato. It’s deep red color and juicy flavor makes it one of the most common items found on grocery store shelves and farmers’ market tables. It strikes the perfect balance between sweet and tangy. The cucumber is often utilized because of its cool and refreshing properties. It’s frequently used in salads, wraps and as a flavor enhancer to water. Today’s appetizer combines these two ingredients with herbs and the light and tangy creaminess of goat cheese. If you aren’t a big goat cheese fan, feel free to substitute a more common and less pungent cheese like Neufchâtel or good ol’ cream cheese. We chose goat cheese because it’s one of our favorite cheeses and we have a great local farm that provides a wide variety of quality cheeses. I mean honestly, the folks at Step Ladder Creamery feel the same way about their goat family as we do about our Little Sprout! You can taste all that love in every product they make. English cucumbers as well as the parisian variety have thin skin which lends well to this dish. One of our favorite ways to change up this app is to add bacon crumbles. It transforms this dish into a bite sized BLT. You can also play with the herbs based on what you have growing; parsley, basil, onion chives and thyme are all great ideas to customize this appetizer. Remember to tag us on social media with your dishes! We’d love to see if you try one of our recipes. You can find us on Instagram and Pinterest. 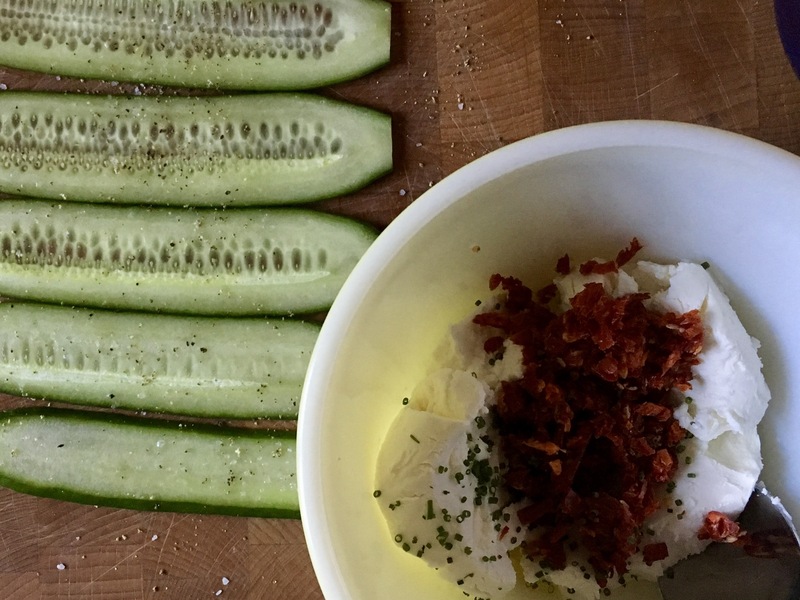 Tangy and delicious bites of fresh cucumber, goat cheese, sun dried tomatoes and spices. 8 oz. quality chèvre, softened. Wash the cucumber(s). Cut the cucumber in thirds so that you have three pieces, if using the English variety. Carefully slice each into long, thin strips about 4-5” long. We like to use our mandolin for this but any sharp knife can do the job. You can also use a box grater with a “slice” side. 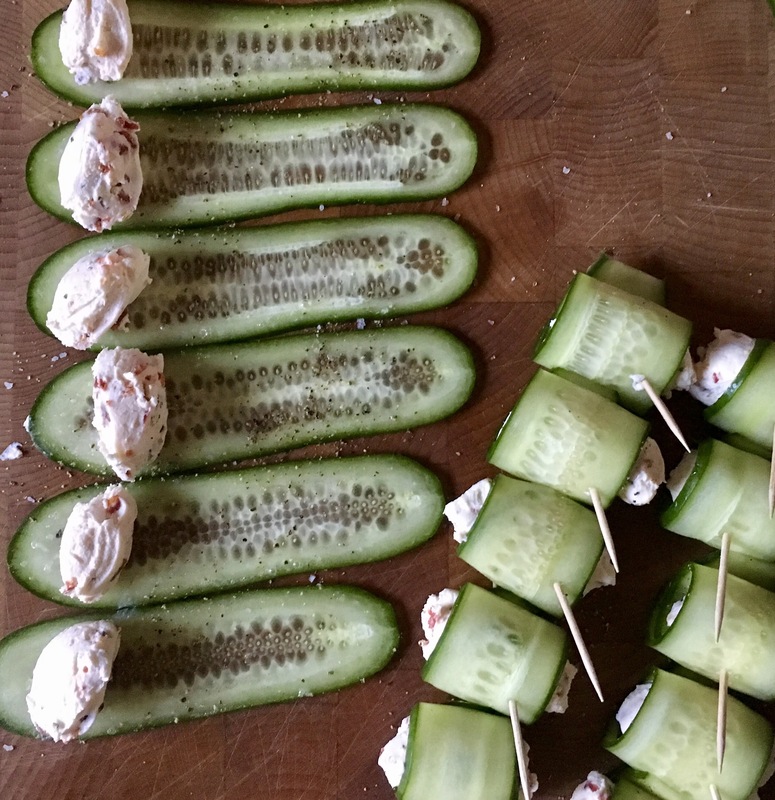 Lay the cucumbers down in one layer. Lightly sprinkle them with salt. In a bowl, combine the chèvre, chives (or other herbs on hand), sun dried tomatoes, and a little salt and pepper. If the mixture is stiff, add olive oil, a 1/2 tsp at a time, until you get a smooth consistency. Next, spoon about 1 tsp. of the cheese mixture onto one end of the cucumber slice. Slowly roll, the cucumber up and secure with a tooth pick. Arrange pinwheels on a serving platter and serve. NOTE: This recipe is a great “make ahead” dish. The flavor develops when the pinwheels are stored in the refrigerator overnight before serving. Just make, plate, wrap in cling-wrap and chill overnight.